Compared to the online interaction behavior of other users, little is known about the difficulties dyslexic Web users encounter online. 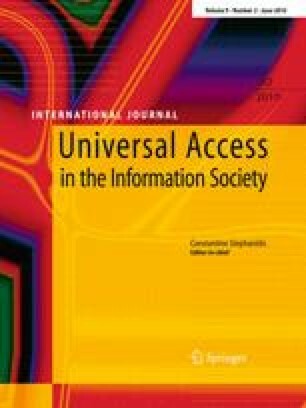 This paper reviews existing literature at the intersection of dyslexia and accessibility research to determine what useful knowledge exists regarding this important and relatively large group of users. This review uncovers that, although there are few published usability tests with dyslexic users, there is a considerable body of knowledge on dyslexia as well as many design guidelines for authoring dyslexic-accessible interfaces. Through a comparison of existing accessibility guidelines for dyslexic and non-dyslexic users and discussion of the plain language movement, it is argued that dyslexic-accessible practices may redress difficulties encountered by all Internet users. This conclusion suggests that usability testing yielding a clearer profile of the dyslexic user would further inform the practice of universal design, but also that enough knowledge is already available to allow doing more to increase accessibility for dyslexic Internet users.